The first concert I ever attended took place at the old Apollo theatre in Glasgow. I still remember the excitement of waiting for the Eagles to take the stage and then that exhilaration which gripped the audience when they started to play. I was just 15 but found in that concert the ability to lose yourself in the music; to be so caught up in enjoying yourself that you forget all your worries for a while. I can remember heading home after it with my friends soaked in sweat from all the jumping around we did but totally happy. The only thing which matched that feeling was watching Celtic win a big game. Growing up in Glasgow in the 1970s we were always aware of the struggle and suffering going on just a hundred miles away in the north of Ireland. I would come home from school and be greeted with news items about the latest tragedy and looking back the reporting of events there was always a little skewed. ‘Here are those two tribes of Paddies killing each other again while the good guys from England tried to keep them apart’ was the general drift of the narrative. However the Irish community in Glasgow always had a network of friends and family there and the tales we heard from folk on the ground often differed from the narrative on the news. No one who is being objective can deny that there were truly dreadful acts carried out by the para-militaries on all sides of the conflict but there remains an underlying conviction that the state forces at play were themselves fighting a covert and very dirty war. A war they tried to hide from the public and still remain very reluctant to discuss. Those who were interested in what was going on in the six counties didn’t have to rely solely on the mainstream news outlets, back then you could always buy left wing or Republican newspapers at certain stores in places like Glasgow or from street vendors hanging around Celtic Park on match days for an alternative slant on events. There were occasional documentary series like ‘World in Action’ which gave a more balanced insight into events. I always found talking to people who travelled over for the football to be most illuminating though. The tales they told suggested the forces of law and order could be far from impartial at times. This week I finally got around to watching the excellent documentary ‘The Miami Showband Massacre’ on Netflix and it delved into some dark places indeed. The band was made up of young men from both the Republic of Ireland and Northern Ireland and was of mixed religion. They didn’t play political music but rather offered a safe space for young people of both communities to come together and leave the stress and worry of the troubles behind for a couple of happy hours and just enjoy being young. Footage of their concerts from the time shows a sea of happy young people lost in the music and finding that same escape and exhilaration I did at my first concert. The band played a concert at Banbridge in County Down in July 1975 and after the gig loaded their mini bus up for the long drive back to Dublin. As they travelled down the A1 towards Newry in the darkness they were stopped by what appeared to be a British Army checkpoint. Stephen Travers, the band’s bass player who hailed from Carrick-on-Suir in county Tipperary was initially unconcerned as such checks were not uncommon in those times. The band were ordered out of their mini bus and lined up in a layby by the road side by men in the uniform of the Ulster Defence Regiment, a locally raised unit within the British army. Travers also noted a man with a strong English accent there too. At least four of the men in uniform that night were indeed soldiers in the British Army’s UDR regiment but they were also members of the UVF. As the band waited by the roadside the soldiers attempted to load a bomb onto their mini bus with, it seems, the intention of it exploding as the group headed south. It is thought that the bomb was meant to explode en-route, so that it would appear that the band was republican bomb-smugglers and thus stricter security measures would be established north and south of the border. Things went awry though when the bomb exploded prematurely killing two of the soldiers handling it. One can imagine the confusion and terror the band felt as the explosion blew them off their feet. The other members of the ‘army’ patrol then began firing their weapons at the band members killing three of them and seriously wounding two others. Steven Travers’ wounds suggest they used ‘dum-dum’ bullets which are filed to ensure they fragment on impact thus inflicting dreadful internal injuries. It was, even by the standards of the time, a cynical and despicable crime. Three men were convicted of the crime and sentenced to life in prison. Two were serving soldiers and one was a former soldier; all were thought to be members of the ‘Glenanne gang’ a loose alliance of rogue UDR soldiers, RUC officers and loyalist paramilitaries. The role of British military intelligence in supplying and directing the gang in their activities remains a point of great contention. Collusion between state agents and loyalist paramilitaries during those dark years remains an area shrouded in disinformation and obfuscation but there is little doubt it went on. Many of the counter-insurgency tactics the British military employed in their colonial struggles were imported into Northern Ireland with deadly effect. The sheer hypocrisy of claiming to be upholding law and order, while assisting in, covering up or failing to halt serious offences occurring, remains an utter scandal. 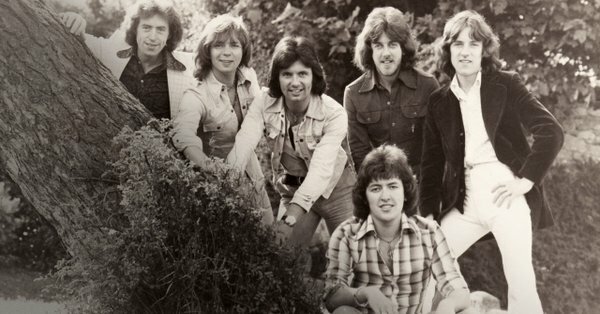 What I took from the documentary though and subsequent reading about the attack on the Miami Showband was not just anger at the inexcusable behaviour of those who carried out and assisted in the execution of this atrocious crime but admiration for the courage and integrity of those who survived it. Stephen Travers was a man clearly traumatised and changed utterly by what he had suffered and witnessed that night but he used his pain to try and find some truth about what happened. The documentary revealed a little of the journey he has been on in his quest to find truth. It took immense moral and physical courage to meet and speak with a UVF spokesman about their version of events. Even when the man was not being entirely honest about what occurred, Stephen calmly told him so but also simultaneously assured him that their dialogue should continue and be carried out without rancour and recrimination. This ability to listen to the ‘other’ is something which was wholly missing in the dark days of the 1970s. Remarkably he carries little bitterness and spoke eloquently about the need to confront the past with honesty something many, including the British establishment seem unwilling to contemplate as yet. He is rightly angry at delays, cover ups and barriers put in his path to stop him learning the truth of what happened that July night in 1975 and who ordered it. The victims of the conflict are often the ones who receive the least attention but long after those who perpetrated such crimes are gone and forgotten we’ll remember people like Stephen. Such voices speak quietly for the victims on all sides who were guilty of nothing save being in the wrong place at the wrong time. Stephen Travers courage reminds us that there are still good people who can rise above tribalism and petty politics to remind us that the victims of violence aren’t statistics but real human beings who are physically and psychologically scarred for life by their experiences. The Miami Showband documentary reminded me in some ways of another documentary film I watched late last year. The Ballymurphy Precedent,’ which told the story of the army’s killing of civilians in Belfast in 1971, again reminded us of how the innocent suffer. Stephen Travers is closer to the truth now than he was in the past but some still hide behind their lies and cover ups. I hope one day he finds out the whole story and finds some sort of closure. Like so many others he was a good man caught up in dreadful events. Rest in peace Fran O’Toole, Tony Geraghty, Brian McCoy and all the innocent victims caught up in the troubles. The best memorial to them all would be to ensure such things never happen again. Brown, who took an elbow to the face in the game as well as that punch from Kent, was guilty of nothing more than raising his hands in victory near those poor, sensitive souls in the away end who fill the air with bile every time they visit Celtic Park. We see players showing out to opposition fans every week in the SPFL, indeed Mr Halliday wasn’t slow to gesture to the Celtic supporters after his team scored a goal against Celtic recently. We’ve also witnessed Kyle Lafferty, openly celebrate in front of Celtic fans after scoring a rare goal. I’m not complaining about any of this, it’s all part of football and you take the rough with the smooth. The SFA have contrived once more to make themselves look foolish with this trumped up charge against Brown. It did not go unnoticed that his hearing comes in early May and if the charge is upheld Brown could well miss the game at Pittodrie and/or Ibrox. Celtic will vigorously fight the charge of course and so they should as they have logic as well as video evidence on their side. Mind you when did logic ever influence the folk who make decisions at Hampden? They have led Scottish football into the wilderness with predictable ineptitude over the years and I have little confidence they’ll show common sense over the latest storm in a tea cup involving Brown. It’s fair to say that none of this would be being discussed had not Andy Halliday lost the plot and charged 40 yards to confront Brown like an emotional 5 year old. As their season turned to ash before their eyes, he behaved like a spoilt brat instead of leaving the field with that ‘dignity’ they’re always going on about. Contrast his behaviour with Celtic leaving the field at Ibrox after December’s defeat. The common thread here is a team unable to take defeat with any grace. It’s plain to see that they really thought this would be their year and believed the press hype which surrounded their appointment of Gerrard and the signing of Defoe and Steven Davis in the January transfer window. Even former Celtic star, Charlie Nicholas, stated that they’d win the title. Disappointment, it is said, is to be found in the gap between our expectations and reality. The reality for Rangers is that despite spending millions on players and Celtic having a host of players injured this season they are still a country mile behind the Champions in the SPFL and out of both cups. Like any side they can rouse themselves when facing Celtic and give them a real game but they have spilled points against the better sides in the SPFL and that has killed any hopes of a title challenge. The frustration of their season ending is such disappointment is a more likely underlying cause of their poor behaviour than anything Scott Brown did. Celtic will now march on to their eighth consecutive title and continue a once in a lifetime journey towards the magical ten. The Board has a big decision to make about who will lead the side next season and should Neil Lennon complete the treble it would be hard to bet against it being him. Whoever it is will deal with a squad requiring investment and reshaping to ensure this golden opportunity isn’t lost. This season has been a tumultuous one on and off the field in Scottish football but as Celtic close in on ten in a row I get the feeling we will see much more controversy and discord. Celtic’s dominance of Scottish football is too much for some to take. We saw that last Sunday. I read a huge book then borrowed from the long gone Townhead Library called ‘A history of British football.’ As usual English football took up 95% of the book with football in the other nations of these islands stuck in a small section at back. The section on Scottish football began with the words… ‘It is tempting to say the history of Scottish football has been the history of three great clubs (Queen’s Park, Celtic and Rangers) and a century of battles with England. That patronising tone and lack of any real knowledge about Scottish football still exists today as organisations like Sky TV regularly discuss Scottish teams while showing the wrong crest on the screen. Queens Park of course were Celtic’s main protagonists in the club’s infancy and still sit third in the list of all time Scottish cup winners with 10 wins. Amazing to think a team of amateurs who last won the cup in 1900 are still ahead of Hearts (8 wins) and Aberdeen (7 wins) but the book I read all those years ago was correct about the dominance of Celtic and Rangers who have between then won 103 of 122 championships contested. It’s the way of it in smaller countries that a few teams dominate and this can be seen in countries Norway, Sweden, Denmark, etc. Indeed in Portugal the big three (Benfica, Porto & Sporting) have won 82 of 84 titles contested with Boavista and Belenenses having one title each. 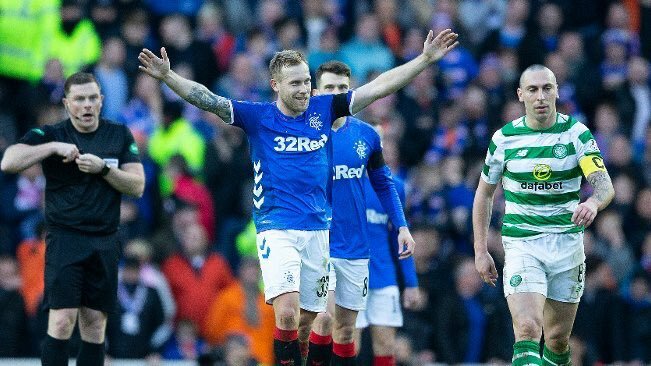 The dominance of the big two in Scottish football may not be popular with long suffering fans of other clubs who watched them win trophies and take their best players away from them but it meant that the games between Celtic and Rangers often defined the season. I’ve seen so many of these matches over the years and experienced all the triumphs and disasters that come from being a committed fan. The exhilaration of watching Celtic seal the league against Rangers in that incredible 4-2 match in May 1979 will live with me all my days. We trooped back home singing all the way after that game, hoarse and utterly exhausted but also delighted. There were cup final wins, high scoring victories and of course days when it went wrong and you were on a downer for a week. 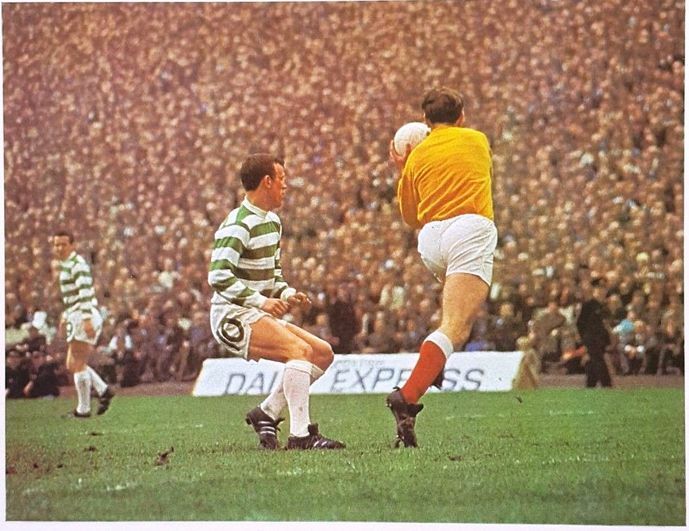 The fixture seemed to dwarf all the other games played in Scotland and indeed the attendance at a Celtic-Rangers games was often more than the rest of the league combined. History has also added layers of identity to both clubs which has added an edge to their rivalry which often drifts into outright hostility. I’ve had some hair-raising experiences attending derby games in Glasgow over the years and been on buses which have had the window ‘tanned,’ saw disorder on a major scale on a few occasions but overall the games, for all the ferocity of the rivalry have been played in front of noisy but well controlled fans. It’s always interesting to see the reaction of an outsider to the fixture as they can view it with fresh eyes. In the 1990s, I took an American to Celtic Park to watch the derby match. It was his first ‘soccer’ match and he spent much of the time looking around the stadium at the crowd. I asked him what he thought of it when it was over and he shook his head and said, ‘It was like Bosnia with a ball.’ On another occasion I travelled up from England with a friend and we stood in the old Celtic end watching Billy Stark score the winning goal against Souness’ Rangers. He was blown away by the atmosphere and the non-stop racket and said he’d never experienced anything like it. It can be an utterly captivating spectacle and remains the one Scottish match people abroad will sit and watch. I spoke recently to a Swiss chap who said he never misses the game on Swiss TV as it has an edge you don’t get in most other games. It remains the top selling point for Scottish football when it negotiates TV deals with the satellite companies who are keen to show it. The collapse and subsequent humiliation of liquidation which occurred at Ibrox in 2012 meant the fixture vanished from the calendar for a few years as the new Rangers made their way through the lower leagues. Many Celtic fans said they didn’t miss it but I think for some it was the unpleasant face of the match they didn’t miss. 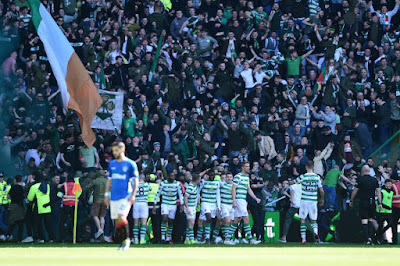 Today most Celtic fans avoid the term ‘Old Firm’ for the valid reason that that tag died with the old Rangers but there is no doubting that fans of both sides now scan the fixture list to see when they will be facing off again. For all its tribalism, occasional madness and vitriol, it is the real deal; a derby match with all the intensity and passion required to make it a game which stands out above the bread and butter of domestic football. The bar was crowded and the noise and laughter was seemingly getting louder at the night wore on and alcohol took its effect. One man though sat silently nursing his pint his eyes focused on the man just a few metres away. His gaze was noticed and the man he was staring at and his companions were ready for any eventuality. As closing time moved closer the man made his move; he walked towards the group of friends his hand reaching inside his jacket pocket. As the group tensed he removed from his pocket a union flag and threw it into the face of his intended target. The incident was not reported in the press nor did the man involved make a fuss about it. It was just another day in the life of Neil Lennon. The above incident took place a few years ago and was one of many involving Lennon in his time as a Celtic player and Manager. His persecution in Scotland still shames the country as did some of the reporting surrounding it. There is no need to recount the long list of assaults, insults, sectarian graffiti and vilification he endured during his years at Celtic. Yes, he is a fiery and sometimes confrontational character, but so too were players like Strachan and Souness and they never endured the off field harassment Lennon did. In that context you’d have to admire his decision to step into the Glasgow goldfish bowl again as Celtic’s interim manager. Who will be Celtic’s manager next season remains open to debate but Lennon is in the box seat and if he manages to win the Scottish Cup and league title it will be difficult to deny him the job permanently. That being said online debate shows that many supporters are far from convinced he is the man to lead Celtic forward. There has been grumbling about the style of play and seeming inability to put teams away when dominating. Last gasp wins against Hearts and Dundee recently have been cited by some proof the team is labouring but to lay this at Lennon’s door seems churlish as some of the performances the team put in before Rodgers departure were similar in their lack of fluency. Virtually a whole team has been side-lined with injury this season and even a team with a squad as big as Celtic’s would feel the effects of key men being out. This has been particularly true in the engine room of the side with McGregor, Rogic, Christie and N’tcham being out for long spells. Debate around who should be Celtic’s Manager next season has centred around a few clear frontrunners but then again no one saw Rodgers coming when Dermot Desmond pulled that particular rabbit out of the hat so we can never be sure who the club will appoint. That being said the supporters are fairly split on who should be the next boss. 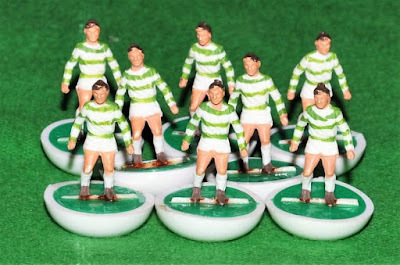 A hard-core remains convinced that Lennon has the passion and know how to lead Celtic to the holy grail of ten in a row. Others cite Marco Rose of Red Bull Salzburg as the man with the know-how and modern ideas needed to not only succeed in Scotland but to begin making a better fist of things in Europe. There is no doubt his RB Salzburg side play against Celtic in this season’s Europa League was impressive but then he is well backed financially and this is allowing Salzburg to dominate domestically and do so playing a quick moving, passing game which when it works looks very exciting. His team defeated Club Brugge convincingly in the round of 32 in the Europa League but were brought down to earth by Napoli though who won 3-0 in Italy. A spirited 3-1 home win wasn’t enough for Salzburg though and they went out. Rose is undoubtedly a good manager with modern ideas. He was well schooled in the German Bundesliga and worked as a coach with RB Salzburg’s youth teams so he knows the game. Tempting him to leave Austria though would not be easy. Steve Clarke is another mentioned for the Celtic Job and there’s no doubt he has organised Kilmarnock into a stubborn side who seldom crumble in games and give anyone trouble. His much publicised statements about the nature of bigotry in Scottish society would of course mean joining Celtic might well bring him the sort of problems Neil Lennon has endured from the Neanderthal elements in our society. Would he want that? Clarke speaks well and knows how to set up a team to nullify opponents but some argue he can be too defensive minded and this might not suit Celtic’s attacking traditions. Then again some of Celtic’s away displays in Europe in recent years were crying out for a more pragmatic approach. You can’t go toe to toe with teams like Barca and PSG who are among the best in the world at what they do. There are many ways to win a football match and good managers choose the one best suited to the opposition. Another name mentioned in the context of the Celtic job has been Roberto Martinez and the man who led Belgium to a third place finish in the last World Cup. This is a really long odds suggestion for despite having played for Motherwell in 2001-02 season and having a Scottish wife, he currently coaches some of the best players in Europe and is spared the day to day rigours of club management. It remains highly unlikely he’d swap his current lifestyle for the climate (literal and metaphorical) of Scotland. Rafa Benitez has been mentioned but again the truck loads of money available in England make a move to Scotland where things are more frugal less attractive. Things are going fairly well for him at Newcastle and I really couldn’t see Celtic tempting him to the SPFL and even if they did would he, like Rodgers before him, soon have one eye of the ‘situations vacant’ down south? David Moyes too is an unlikely shout and would not be a popular choice among most supporters I’ve spoken to. His pragmatic and some argue unexciting style of play would not go down well amongst a support which saw Rodgers develop players and foster a possession based passing game which when it clicked was very good to watch. There is a big decision ahead for Celtic and I’m sure the powers that be at the club are already weighing up the options and discussing candidates. The suggested £9m pay off they got from Leicester City for Rodgers would go a long way to funding a good quality replacement. Will the club surprise us with an unexpected appointment or stick with a more predictable decision by appointing Lennon or Clarke? Either way with the mystical 10 in a row at stake they need to get it right. Once they do appoint a permanent boss, they need to invest boldly to ensure a once in a lifetime opportunity isn’t lost. Too often in the past Celtic failed to build on a position of strength. For now though, we get right behind Neil Lennon and the team as they push for an unprecedented treble-treble. 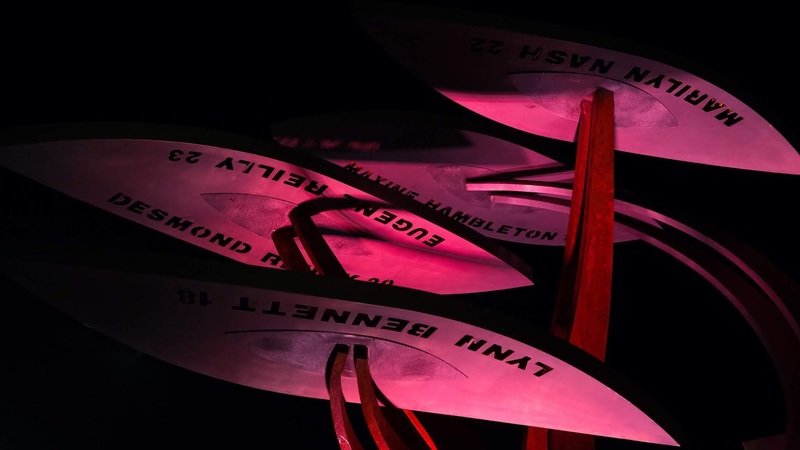 Thinking too far ahead in football can risk losing focus on the task in front of us though so let’s jump the final hurdles of season 2018-19 and we’ll see what Mr Desmond and the board have in store for us in the summer. With the Champions League Qualifiers in July and a possible shot at 9 in a row in the offing, they’d best get it right. When I was a boy I queued outside Celtic Park on a bright August day for a Celtic match against Rangers. The rather inebriated supporter in front of me was told by a Police Officer he couldn’t take a bottle of wine he had into the stadium and that he should put it in the bin beside the turnstile. The chap unscrewed the bottle and drank all of it in two long gulps before throwing the empty bottle in the aforementioned bin and entering the stadium. That scene stuck in my mind all these years and reminded me that the perception of football fans in some corners of society hasn’t altered much since that day long ago. There has been something of a moral panic in Scottish football after a succession of unsavoury incidents involving supporters of various clubs. Chief among them were the incidents at Easter Road where a bottle narrowly missed Scott Sinclair and then the following week we saw a rather stupid young man run on to the track and kicked the ball away from James Tavernier of Rangers. These incidents and a series of coin throwing occurrences, the most serious of which saw a linesman with a cut head at Livingston, led to the media having a severe attack of hyperbole. No one doubts there has been a spike in poor behaviour from a small minority at Scottish football matches but the reaction from the media and politicians has been over the top. Football, we are told, needs to sort out this problem or the Scottish Government will have to act. The collapse of the dreadfully crafted and poorly implemented Offensive Behaviour at Football Act demonstrated clearly that Government action has on occasion made situations worse and not better. You can never separate what goes on in football stadiums from the wider society and to imagine that football is a haven for thugs in an otherwise calm society is simply wrong. A look at our city centres when the pubs and clubs close or even some big horse racing meetings will demonstrate that violence and poor behaviour exists well away from football grounds. That is not to excuse it or suggest that it is in any way acceptable but it remains a societal issue and not just a football one. It may seem unlikely to the middle class hand wringers but behaviour at football matches in Scotland is far better now than it used to be. There was a time when Celtic v Rangers matches would see 200 arrests and degrees of violence in and around the stadium and wider city which today would seem incredible. The drink culture in times past meant far more supporters were drunk at football and many had carry outs with them which left enough ammunition on the terraces for the occasional ‘bottle showers’ I’d see in my youth. In those times some supporters went to the match wearing builders hard hats decorated with club colours to offer some protection as they watched the game. Of course alcohol played a major part in those events as it would again in Manchester in 2008. When you have thousands of predominantly young men drinking all day there will inevitably be some who behave poorly. Celtic fans had their moments too in that era with the infamous ‘Battle of Turf Moore’ in 1978 springing to mind. 10,000 Celtic supporters headed for Burnley for an Anglo-Scottish cup tie and many had been drinking all day. The violence that night was some of the worst I’ve seen involving Celtic fans. Yes, they were goaded by the usual moronic minority you find in most English clubs support but they responded by going onto the offensive in a pretty brutal manner. This link between alcohol and trouble at football is a proven one and it is often a major contributing factor. 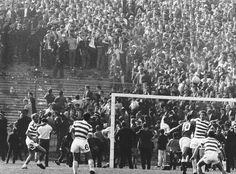 When it was banned from stadiums after the riot at the 1980 cup final there was a calmer atmosphere inside the grounds although certain games still retained the potential for trouble. There was serious disorder in and around Celtic Park when Aberdeen arrived for a cup tie in the mid-1980s for instance and the Glasgow derby still had its usual quota of incidents but the average match was more peaceful. There was still the ‘casual’ culture in which organised groups carried out acts of violence away from stadiums almost as a recreational pastime but it never took root at Celtic although the supporters often had to defend themselves against such groups before and after matches. The advent of all seater stadiums following the Taylor Report into the Hillsborough disaster was a game changer in terms of behaviour in the stadium itself. Fans who misbehaved were much easier to spot and with most now having season tickets, they risked being banned. That being said, the atmosphere in Celtic Park on the day Rangers won the league there in 1999 was pretty hostile. Again though, the stupid decision to arrange a 6pm kick off time on a Bank Holiday weekend meant a minority of supporters had been drinking too much. The footballing authorities and Police should have told Sky TV that the kick off time wasn’t acceptable but they didn’t and a minority let their passions boil over. No one is suggesting we accept the coin and bottle throwing we’ve seen of late but a little perspective is required. 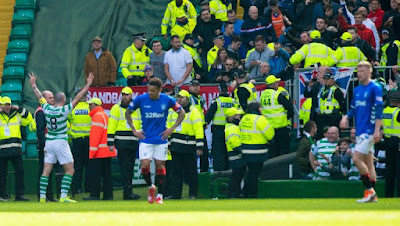 The Scott Sinclair incident took place in front of a dozen Police and stewards who appeared to be simply standing around watching the game. The Easter Road CCTV was seemingly unable to identify the culprit in a far from full stand. It’s in the interest of all decent fans that the dullards who throw things at football are rooted out but labelling all football supporters as thugs or threatening to close stands and punishing the many for the actions of a few is not on. A degree of self-policing would help too; just as the Celtic support shunned the casuals who attempted to attach themselves to the club in the 1980s, so too fans standing beside those launching things should tell them to give it a rest. Limited liability has been suggested too as a way forward. Making the home club responsible for all actions which take place in their stadium is a difficult proposition. Those intent on causing trouble will find a way and it’s difficult to see how a club could stop them. Sanctioning clubs for unsavoury songs is another minefield with all the complexity, history and multi-layered identities our fan bases contain. It has been argued that no one was ever injured by a song but they can set the tone in certain games and clearly football clubs would rather the songs their fans sing to be about football. There has been a gradual evolution in fan behaviour at football matches in Scotland over the decades. The better designed stadiums and the reduction of drunkenness have impacted positively on behaviour at games but in any scenario where thousands of people gather together there will always be a few who don’t know how to behave. Football is a tribal, passionate game which thrives on rivalries and controversy. The challenge is how to keep those more passionate aspects of fan culture while eliminating the less savoury elements. It should never become a sport for the ‘prawn sandwich brigade’ as Roy Keane once called the more corporate supporters and I doubt it ever will in Scotland as there remains a rawness and clannish aspect to our game which is being diluted in the ‘tourist leagues’ of England and Europe. Of course, we all want the bigots and coin tossers to stay away but they are not the norm in our game. Our media and politicians should consider the huge improvements made in supporter behaviour over the years and not use any modern misbehaviour to score petty political points. The vast majority of football supporters are decent and rational people. There is always room for improvement but we’ve come a long way since the guy in front of me in the queue at Celtic Park drank a bottle of wine in under 30 seconds. Ian slipped off his Celtic scarf and tossed it into the back seat of the car. He was still on a high from Tom Rogic’s last minute winner in the cup final just a couple of short hours before and he was dying to tell his old man all about it. He walked towards the front door of the unit his old fella called home these day, the Glasgow drizzle failing to wipe the smile from his face. He heard the familiar buzz of the door locking system opening, pushed and stepped inside out of the damp air. It was comforting to know his old man was secure here and unlikely to wander off. He signed the visitor book, smiling at the slightly stern lady who manned the desk, ‘How has he been today?’ She shook her head slightly, ‘asking for Agnes again, Mr Reid. He also got a bit aggressive this morning.’ Ian sighed slightly and walked along the bright, modern corridor towards his dad’s room. This past couple of years had been hard on the family and as in most families the burden fell mostly on one or two members. In the Reid family it was Ian and his sister Cathie who did most of the running. His brother Terry always had something on, always had an excuse. He had noticed his old man’s behaviour changing in subtle ways over the past few years; forgetting to put on the oven when it was full of food, getting lost on short, familiar journeys. On one occasion he drove all the way to Edinburgh for no particular reason he could recall. He had increasing word finding difficulties and Ian found him looking for what he called his ‘hand clock’ one morning. His moods shifted quickly from calm to angry with no particular trigger they could see and he seemed confused and even depressed some days. When he was ripped off for hundreds of pounds by a con man on the phone, the family persuaded him to see his doctor. He missed the appointment so Ian made another and took him personally to make sure he got there. Doctor Black had been reassuring about what he called the ‘normal processes of ageing’ but quietly told Ian that he suspected it could be early onset Alzheimer’s disease but needed a specialist to confirm it. The following weeks saw Ian and his father visiting a consultant and after a variety of scans, physical examinations, blood tests and discussions on his symptoms it was confirmed as Alzheimer’s. He remembered on particular day at the hospital when his old man had been asked to draw a clock face with all the numbers in the right place and showing 4 o’clock. He tried so hard but the numbers were jumbled and one was missing. Ian was stunned at the implications, his old man was just 59 but further tests confirmed the doctor’s suspicions. That was two years earlier and things had deteriorated to the point where he needed specialist care and had gone into the secure accommodation. One thing he did enjoy was talking about football and if his short term memory was poor, his long term memory was a treasure trove of memories about his beloved Celtic. Ian entered the room and saw his old man feet up on the bed reading a book. He looked up and smiled, ‘Ian, son, great tae see ye. Sit doon, yer Ma will be back any minute.’ Ian sat pondering whether to remind his old man that his wife wouldn’t be back at all as she had passed away 3 years earlier. He let it go and said with a smile, ‘Did ye watch the cup final? That was some finish ay?’ His old man shook his head, ‘was that today? Who was playing?’ Ian continued, ‘Celtic beat Aberdeen. Rogic got the winner in the last minute.’ His old man looked confused, ‘I meant tae watch it but I must have forgot.’ Ian noticed a shadow cross his father’s face, he looked a little sad when he was reminded of his failing faculties. Ian decided to stay on more comforting ground by talking about memories of things long past, ‘Tell me about your first cup final?’ he said with a cheerful smile. His old man put the book down and sat up on the bed, ‘Ah son that a great day. I was just a boy and your old Granda Paddy took me to see the sixty nine cup final. We got the Phil Cole bus in Coatbridge, the singing was grand. Scudded the Rangers four nothing…..’ As he continued his story Ian watched his animated face, happy again reliving days past. It was amazing he could talk about a match from almost half a century before but couldn’t tell you what he did yesterday. They spent a good hour reliving games and incidents from matches they had seen and the adventures they had shared following their team around Scotland. For the next few hours Ian made some memories of his own as they celebrated another Celtic victory. He’d go and see his old man again the following day but for now he was happy to be among friends and singing their songs of hope and joy. Alzheimer Scotland are using our memories of football to improve the life of people with dementia. Whether you know someone who could benefit from attending our meetings, would like to volunteer, donate or raise funds, please take the time to find out more about this ground-breaking work and how to get involved. Celtic’s dramatic late winner at Tynecastle went down very well with the support, offering a much needed boost to morale following Brendan Rodgers abrupt departure. 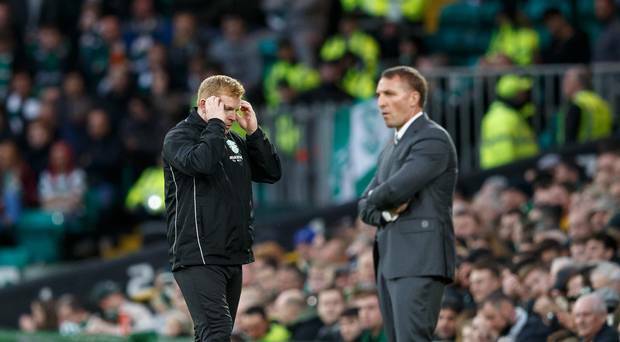 Neil Lennon led the team to a crucial win after a fairly turgid 90 minutes in which the home side’s physical approach had Celtic struggling to find their fluency. To win at Kilmarnock and Tynecastle in the dying embers of both games is testimony to Celtic’s fitness and mental toughness and augurs well for the business end of the season. The match of course followed the departure of Brendan Rodgers which took place with indecent haste and caught us all by surprise. There was no little anger at his abrupt departure after spending two and a half years telling us he was a lifelong fan who loved Celtic. That being said, the few less bright supporters who sang that cringe-worthy song about him need to have a good look at themselves. They have to know in this day and age that they’re likely to be filmed doing such things and you’d conclude from that that they don’t care if it ends up on social media or in the tabloids who seem to actively seek out such videos to get more clicks on their advert filled pages. That being said, the vast majority of fans who are angry at Rodgers wish him no ill. It’s time to move on; all managers leave in the end one way or another. It wasn’t his departure which upset many it was the timing and manner of it. This week has also seen two inquests taking place in these islands. The first is the inquest into the Ballymurphy Massacre of August 1971 when members of the Parachute Regiment killed 10 civilians in Belfast. It seems at last the truth may be getting out as it did in the end about the events of Bloody Sunday. Nothing can assuage the anguish of those who lost loved ones but perhaps some truth and recognition of the huge injustice which took place might help them find closure. The other inquest taking place this week is that into the murder of 21 innocent people in the Birmingham Pub bombings of November 1974. There too families have never heard the full truth about what happened that night and justice is a distant hope. Ballymurphy and Birmingham both saw the innocent suffer and nothing is worth the misery inflicted on the families of those involved in these events. Those of you old enough to remember the troubles will have those events and many, many more etched into your memory. My childhood and adolescence was marked by watching events unfold from afar and wondering how the ordinary folk living in the north of Ireland could live with such stress and such chaos going on around them. I mention these inquests because again there is a fuss about some Celtic supporters singing Irish rebel songs at matches and they offer a stark backdrop to this. Each person must make his own mind up about what is appropriate at a football match in Scotland in 2019. Some are of the opinion that anything goes in a free society while others find it at best distasteful and at worse cringe-worthy and embarrassing. I know folk online who avoid this subject like the plague despite having strong opinions on it. They feel it’s not worth the hassle of bringing it up as they can be labelled a ‘soup taker’ or an ‘uncle Tom’ and generally find themselves subjected to abuse they can live without. The football authorities and the Scottish Government are being pressured to act on what takes place in Scottish football grounds. 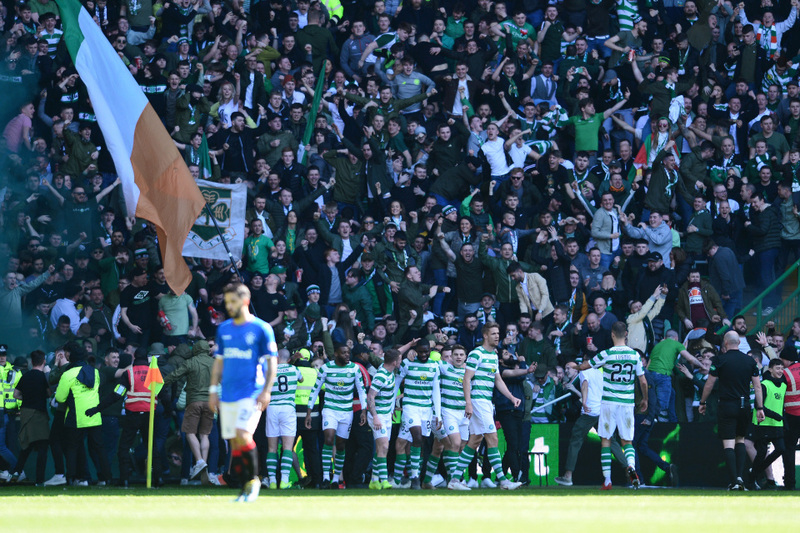 The long standing issue of sectarian singing at Rangers matches appears to getting more flagrant and while many would correctly argue that rebel songs are not in themselves sectarian, the perception that they are is widespread as is the incredulity that football supporters in Scotland should be singing such songs in 2019. The arguments for singing such songs are usually about ‘expressing cultural identity’ and it’s countered by many who say express all you want, just not in a football stadium. Journalist, Tom English, himself an Irishman was challenged to spell out which songs are sectarian and replied, ’Roll of honour, sung endlessly by those clueless morons in the Green Brigade, celebrating men who targeted and killed Protestant civilians, including two babies.’ These are harsh words but that is the perception many have about singing IRA songs at Celtic matches. Journalists who criticised the behaviour of football fans and call for strict liability are accused of selective hearing and subjected to a tirade of ‘whataboutery’ which circles around meaninglessly instead of people actually stopping to think and engage with the issue. Of course supporters of several clubs have an issue to sort out regarding their songbook but the two Glasgow clubs dwarf the opposition in Scotland in terms of support and the issue is magnified with them. I’m not telling anybody what they should do or what they should sing at a football match. That is up to each and every individual to decide for themselves. I am though laying out how it is perceived and damage it can do to a club like Celtic’s reputation. It hands those with no love of Celtic a big stick to beat the club with and the excuse they crave to lump Celtic supporters together with the worst elements at Ibrox. The old ‘two cheeks of the same arse’ argument does the rounds again and the lazy ‘Old Firm bigotry’ stories roll in the media again. That is so unfair to the vast majority of Celtic supporters who don’t have a bigoted bone in their body and want their club to be an inclusive and open organisation which lives up to its founding principles. People in the north of Ireland are slowly trying to draw a line under the past and trying to build a better future for all the people living there. The horrors of the past haunt so many and truth and healing are needed if that better future is to become a reality. I hope the families of the victims of Ballymurphy and Birmingham find some closure and perhaps some truth. In the end violence begets violence and the innocent suffer. Perhaps it’s time we sang a different song.